We’re pleased to announce that all users of PBworks will soon have access to nested folders. This means that soon you will be able to place a folder inside of another folder. This has been one the the top requests from users and we’re excited to release this feature to our entire user base – including free users! 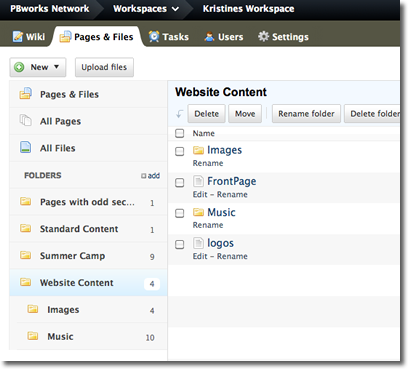 Nested Folders is deceptively simple feature, particularly with premium workspaces that have folder level permissions. Placing a folder inside a parent folder works exactly the same as placing a page inside a folder. If a folder has no security controls, it will adopt the security controls on the ‘parent’ folder. If the folder has specific security controls, they will override those set by the ‘parent’ folder. As always, the more specific security controls override those more general controls. Learn more about PBworks Nested Folders and Folder Security. In case it isn’t immediately apparent, you can drag-n-drop folders in the Pages & Files tab. If you want to move a nested folder to a top-level location, drag the folder to the Pages & Files item near the top. I’m both excited and dismayed at this move, in the same way that I am about the Gmail nested labels. More organizational complexity == bad. Better sharing and access controls == good. I think you missed the bullseye on nested folders. The change has been almost useless because you can’t roll up or minimize the group of folders in the folders sidebar. One of the biggests points is to be able to shorten the list of folders in the left-hand side bar in the Pages & Files. Isn’t that one of the biggest purposes of nesting? Do you not use this function when organizing your files on your own computer drives? If someone doesn’t want the list of subfolders minimized, then they don’t have to. But for goodness sakes, give us the ability to do so if we want to. I know that PBworks is trying to make improvements that users request, but you usually only go half way and it’s really disappointing and frustrating. So I hope that you will enhance the feature and allow full ability to nest folders. I’m not quite certain what folder behavior you’re referring to. When you use nested folders, only the parent folders show up on your list of folders – therefore limiting the number of folders shown. To be exact – when you place a folder within a folder, only the parent folder appears in the navigator. You then click the parent folder to view the folders, and pages filed inside. If this is not what you’re seeing, please contact the support team and we will look into this for you. I am delighted to be able to use nested folders to organize my wikis. Thank you PBworks! It was hard to find your posts in google search results.